In this handout photo provided by Vietnam News Agency, Donald Trump and North Korean leader Kim Jong-un during their second summit meeting at the Sofitel Legend Metropole hotel on February 28, 2019, in Hanoi, Vietnam. The second summit meeting between President Trump and Chairman Kim Jong Un in Hanoi, Vietnam, inspired hope for real progress in negotiations with North Korea, and an agreement on concrete steps toward denuclearization that has thus far proven elusive. While the talks ended with no agreement, diplomacy is still the only way forward. There are troubling reports that U.S. National Security Adviser John Bolton may have played a negative role in scuttling a potential deal by inserting an eleventh-hour demand to address North Korea’s biological and chemical weapons. However, U.S. positions on sanctions relief, humanitarian exemptions to sanctions, denuclearization and steps toward inter-Korean reconciliation have been far too rigid since last year’s Singapore Summit. Fixing that is not rocket science. While no declaration announcing the end of the Korean War emerged from the Hanoi summit, that goal is still alive, and still crucial. While such a declaration could be seen as little more than a symbolic gesture, its benefits are actually quite concrete. 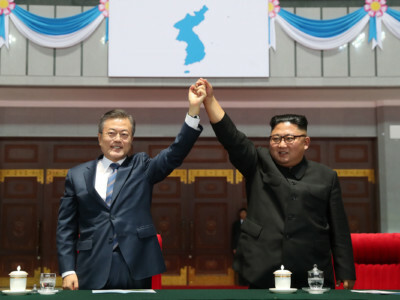 Not only would it immediately relieve tensions and reduce the risk of renewed conflict, it would also provide the basis for further negotiations to conclude a formal peace agreement to finally and officially end the Korean War. Securing a final peace agreement is critical not only for reducing the risk of war, but also for advancing the goal of denuclearization, since the ongoing state of war is North Korea’s primary rationale for pursuing and maintaining a nuclear deterrent. South Korean President Moon Jae-in has already voiced his support for this type of declaration. Far from mere symbolic gestures, the end of war declaration and a formal peace agreement are both versatile diplomatic instruments that can be tailored to support U.S. interests while also mitigating North Korea’s security concerns. While we don’t know all the details as to why the hastily organized summit did not deliver an agreement, President Trump did express approval of North Korea’s offer to permanently close its main nuclear facility at Yongbyon. While he mentioned his desire to address other nuclear facilities, shutting down the Yongbyon facility, a centerpiece of North Korea’s nuclear program, would be an excellent first step toward complete denuclearization. The price tag need not be too high; perhaps some sanctions relief for food, medicine and easing restrictions on non-strategic economic activity, and the opening of liaison offices (a step below embassies) in Pyongyang and Washington. That package should be able to come together soon, and wouldn’t necessarily require another summit. Next, South Korea’s President Moon Jae-in, who has been tireless in his pursuit of peace and reconciliation, must play an enhanced, facilitating role, with China’s leader Xi Jinping perhaps joining in. In addition to nuclear diplomacy, deepening inter-Korean cooperation would foster a degree of economic interdependence between North and South Korea that would make the two Koreas more secure — economically, politically and militarily — and would help remove North Korea’s justification for maintaining a nuclear arsenal. It would aid in North Korea’s economic development. And because increased economic ties and security for North and South Korea mean increased security for the U.S., multilateral diplomacy and engagement is a win for everyone. The alternative to these steps toward peace is unthinkable. A war on the Korean peninsula would likely result in the deaths of tens of thousands or hundreds of thousands of innocent people. Meanwhile, a war on the Korean peninsula would substantially depress U.S. economic performance both in the region and globally. South Korea is the United States’ seventh largest export market and sixth largest supplier of imports. A prolonged conflict on the Korean peninsula would also significantly increase U.S. federal debt, which is already larger than our annual Gross Domestic Product. While it would have been unrealistic to expect a comprehensive, final deal in Hanoi, hopes were raised for concrete progress toward that goal. As talks continue, it is worth remembering that while an end to economic sanctions, a permanent end to the Korean War, a peace agreement and the denuclearization of the Korean Peninsula would rightly benefit Koreans, all of these steps are also in the best interests of U.S., regional and global security. Regardless of understandable concerns about the harmful policies and actions of both President Trump and Chairman Kim in other realms, Americans of all political stripes and their representatives in Congress should support the continued pursuit of peace through diplomacy. Thankfully, Rep. Ro Khanna (D-California), along with 18 original cosponsors, just introduced legislation articulating support for the nascent peace process and offering a common-sense vision for progress in negotiations. Congress is right to get involved in support of a productive and thoughtful diplomatic process. Kevin Martin is president of Peace Action, the country’s largest grassroots peace and disarmament organization with over 200,000 supporters nationwide. He also serves as coordinator of the Korea Peace Network, a coalition of peace groups, arms control groups and Korean-American activists working for peace on the Korean Peninsula. The US and its Korean military operations are the biggest roadblocks to peace on the Korean peninsula. International sanctions and Trump’s travel ban are seriously hindering aid to North Korea’s most vulnerable.